But unfortunately, all his mouse friends have other plans for the day. So the story switches to a day in the life of a mouse – climbing Mouse Mountain, drinking hot chocolate at the top, and then skiing down the snowy hillside. It looks like fun, though there’s still festive thoughts in the head of the solitary mouse. When he reaches the top of the hill, he even imagines that he’s sitting on a giant birthday cake! 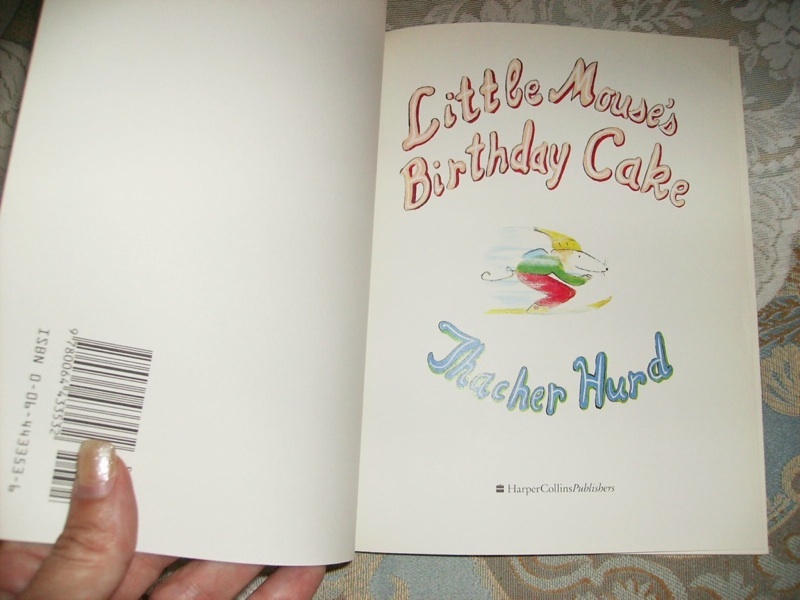 Thacher Hurd drew cheerful illustrations for Little Mouse’s Birthday Cake, and the book feature bright pastel colors filling simple sketches of the little mouse with the big, pointy nose. He comes from a family of illustrators, and his father (Clement Hurd) was the illustrator of Goodnight, Moon. Thacher’s mother, Edith Thacher Hurd, also wrote more than 75 children’s books, according to the Harper Collins web site. It’s hard not to wonder if their son Thacher absorbed their love of children’s literature, and was influenced by their work when he drew this book’s illustrations. It looks lonely, but it makes the story more effective, since it’s ultimately a book about friendship. Alone in the tree, the mouse dreams about a giant pink birthday cake that’s rolling after him down a hill. And when he wakes up, he sees bright yellow lights flickering through the trees in the distance. “Far away, Little Mouse heard someone calling his name.” It’s his friends, who’d come looking for him, and followed his ski tracks until they found him. And when they lead him back to his home, the mouse discovers it’s been decorated for a birthday surprise party. Hurd wrote one other book about the character – “Little Mouse’s Big Valentine” – but it never really caught on with the book-buying public. Maybe the story was too generic, but I thought the illustrations were appropriately cheery. When the mice all arrive for the birthday party, the room is filled with a yellow light from the fire. And the book ends with the mouse’s face lit by the yellow glow of his birthday candles.